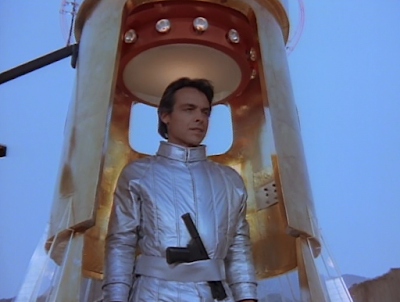 Leave it to David Gerrold -- the talented creator of "The Trouble with Tribbles" on Star Trek and the story editor for the best year of Land of the Lost -- to give audiences a reprieve here: the very best early episode of Logan's Run: The Series (1977). Of course, you won’t find Gerrold’s name anywhere on the episode’s credits. This episode was penned by Noah Ward. (Get it: No Award). Looking back on the episode, I wonder if Gerrold regrets not taking credit for the good work. 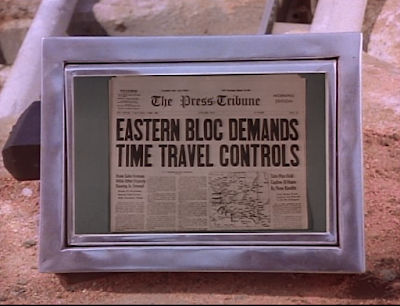 I mean, perhaps -- in the great scheme of the universe -- this episode may not be the greatest thing since sliced bread, but "Man out of Time" is an inarguable high point in the Logan's Run TV canon. It also showcases the writer’s ethos; his essential morality as a human being. And that’s a beautiful thing. "Man Out of Time" (by Noah Ward and directed by Nicholas Colasanto) begins in December 2118, only a short time before the nuclear war that will destroy the world and lead to the shattered landscape Logan, Jessica and REM dwell in. A group of committed scientists are working on "The Sanctuary Project," an experiment with time travel. 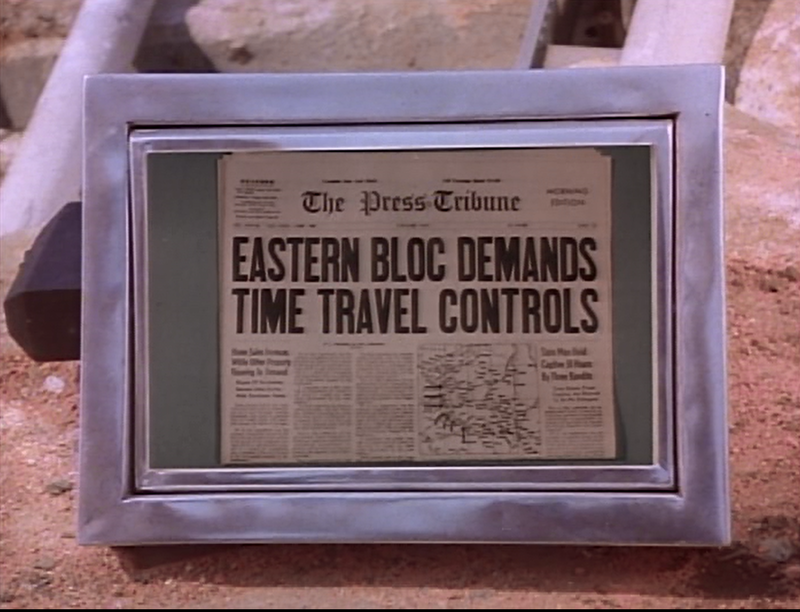 They can open a time portal to the future for 22 hours, and plan to send scientist David Eakins (Paul Shenar) through to investigate the future, determine the cause of the nuclear war, and then come back in time and (hopefully...) prevent it from ever occurring in the first place. Eakins travels to the 23rd century and meets Logan, as well as the primitive, barbarous descendants of the Sancutary Project, people who worship the project computers and can't even read. While Logan, Jessica and REM try to help these people grow more self-sufficient, David Eakins realizes that if he undoes the future, he'll also be preventing the births of his new friends, Logan and Jessica. But still, David heads back to the past to see what he can change. His last contact with Logan and Jessica and REM is a shattering message sent to the future. Back in the past, he's discovered the cause of the nuclear war....it's him. David's discovery of time travel and subsequent successful journey through time has spawned a new and deadly arms race, with enemy nations demanding the technology to travel through time. 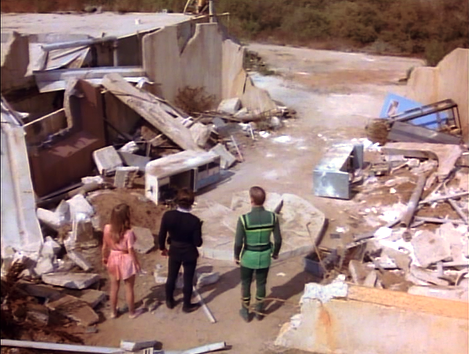 "Only 12 more shopping days till Armageddon," Eakins quips in “Man out of Time” at one point, and that kind of snappy humor is only a part of this fine episode of Logan's Run. More importantly, all the dramatis personae come across as well-developed individuals for a change (including Logan and Jessica), and each acts according to the strengths and weaknesses of his own unique character, not stepping out of those parameters because of plot demands. But more importantly, the episode builds logically and inevitably to the shattering conclusion described here. "History has a way of catching up with mankind," says REM, and he's right...there's no going back, no matter how hard David Eakins attempts to change things. The events of this episode, and the particulars of time travel, force the audience to consider some key moral questions. Is it right to “wipe out” one future -- Logan and Jessica’s -- to create another? There are no guarantees if the future is changed, for example, that a different war won’t occur. Or perhaps, eventually, great good can come from the great evil of the nuclear holocaust. Perhaps people like Logan and Jessica will build a more just world that would not be possible in any other reality. But is a world of empty desolation better? 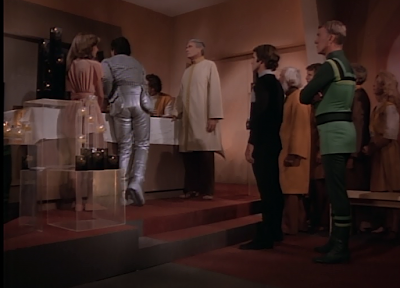 There are so many factors involved in a decision of this magnitude, and there has been no issue of this “weight” yet in Logan’s Run: The Series. The great thing, of course, is Eakins’ journey. He lives up to the old proverb that man proposes and God disposes. He has spent his professional life developing a technology to save the future, only to find that his life’s work is the very thing that destroys that future. What a bitter pill. And yet, in his final message to Logan, there is grace, and even hope. “Don’t give up hope looking for your sanctuary,” he advises. 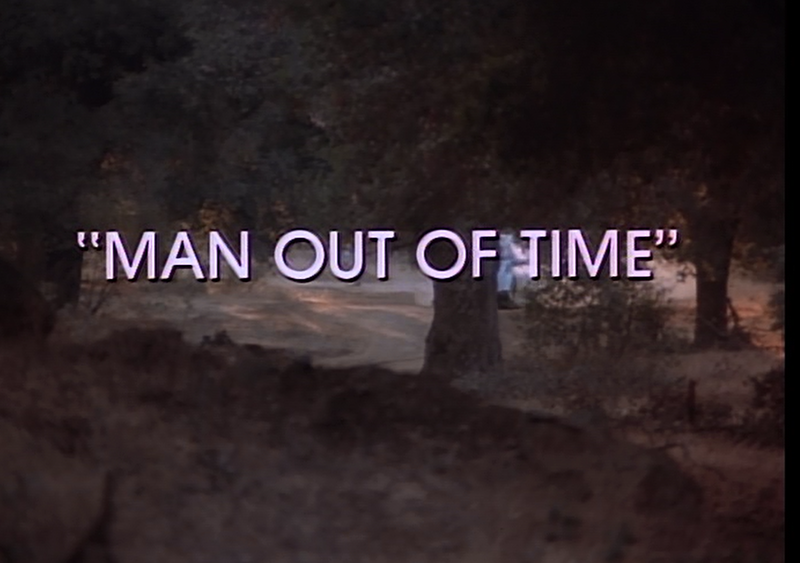 I also appreciate “Man out of Time” because it is the only episode thus far of the series to deal in any substantive way with the concept of Sanctuary. The Sanctuary Project of the 22nd century seems to be, at least, the spiritual ancestor of Logan and Jessica’s Sanctuary. The word “Sanctuary” must have been one used by survivors of the project, in the early days of the nuclear winter, or holocaust. Eventually, it drifted into legend and myth, but was still spoken of, as a place of safety and hope. 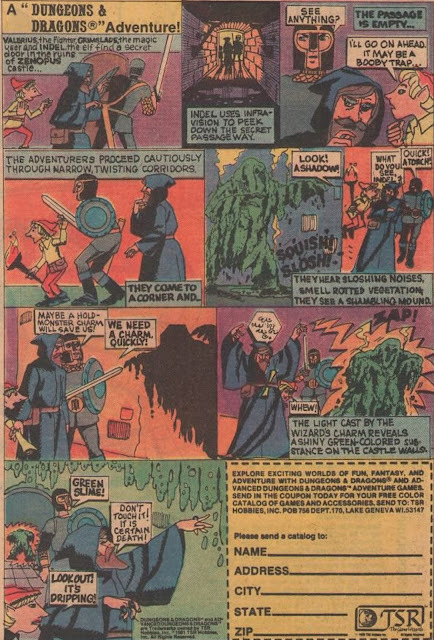 I only wish that this short-lived series could have described, in greater detail, the Runner legends of Sanctuary, and how it came to be existed. This episode is as close as we get, and it’s a tantalizing piece of the puzzle, and I’m glad it’s in the canon. 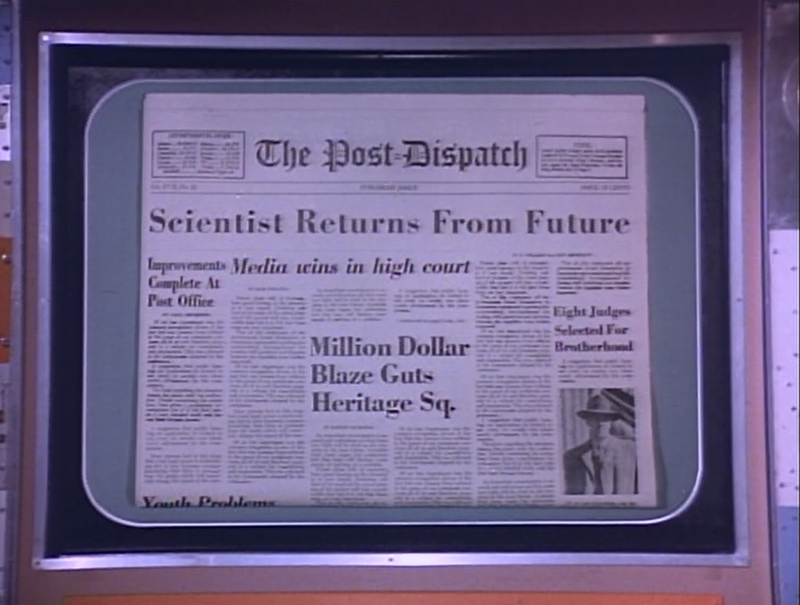 In a way, this episode, “Man out of Time,” is the viewer’s reward for making from the pilot (which is promising) through the first three regular episodes. 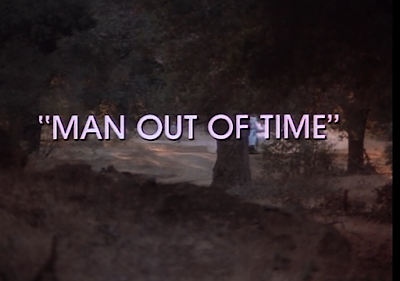 John, extremely accurate review of “Man Out of Time”. It is truly one of the best episodes of the this series along with the pilot episode. The Logan's Run canon of the Sanctuary Project is fascinating and would have fit into the 1976 film too. Maybe in the reboot film this will be used. As a child of the 70s, I, of course, watched both the film and the series (perfect for someone all of 6-7 years of age then, too, despite the cheesy, "future disco" decor and costumes - a horror show of flowing wraps and gauze, not unlike civilian clothing the ST:TNG) and don't remember it actually being decent from time to time. Great concept! It may be worth mentioning that the time-travelling protagonist of Gerrold's novel "The Man Who Folded Himself" was a Daniel Eakins. Perhaps David was meant to be a descendent? This episode (and "The Crypt") showed what this series could have been (and perhaps would have been given time). 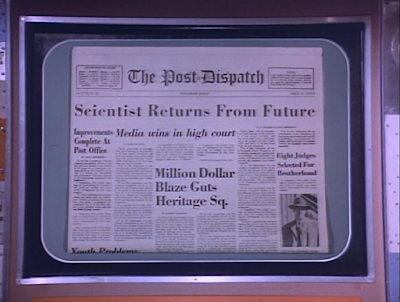 I think this episode equalled any other 70's television science fiction. I love how you keep unearthing a lot of cool stuff I didn't know about, John. Also, whenever someone mentions Paul Shenar, I think of the villanous Alejandro Sosa from "Scarface". This was directed by Nicholas Colasanto? The guy who played "Coach" from "Cheers"? Cool!